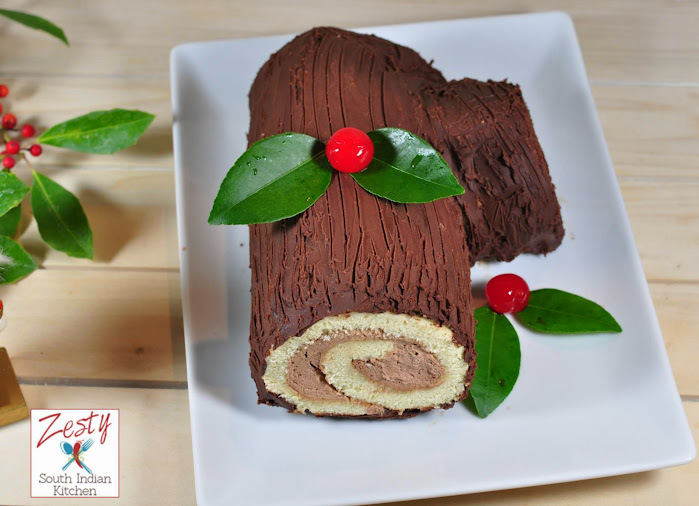 As it is Christmas time, we Baking Partners decide to bake a Yule log cake for this month challenge. Tanusree of Ma Niche suggested this month’s theme. First I decide to do a Chocolate Yule Log or ‘bûche de Noël’ for that I made chocolate sponge cake first, however the recipe was far from perfect, and it failed miserably. 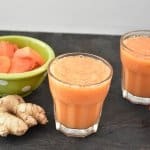 So next day I spend entire day on researching the recipe finally I selected one from French recipe site with video in it. Burning of Yule log is a tradition which is connected to ancient winter solstice festival of ancient Celtic tradition which was started in 12th century, they used burn large Yule log in the fire place in the belief that it will protect the house from lightning as well as against evils of devil. This was also a way to celebrate the rebirth of the sun as well as give thanks for the warmth and life it would bring with it. The Celts believed that certain trees, specifically oak, beech, elm, and cherry trees, had certain mystical powers. This custom varies from various region of Europe. They used heat the log with last year burnt piece of wood. If you want read more about history of burning Yule log please read from here. However during the Napoleon era, he stopped burning the wood thinking that air gets polluted through the chimneys and it is result of sickness happening around. This result no way of burning Yule log in home, as result a Persian baker decides to make a symbolic cake in the form of Yule log. Another explanation was that the Yule log needs to burn for 12 hours, and newer built house could not hold that much Yule log, hence they invented the cake. Also it was in the 19th century when it became the fashion to serve similar thinly rolled sponge cakes with jam or cream filling and covered with butter cream. However the first written document of buche de noel cake was in a cookbook called Le Mèmorial Historique et Gèographique de la Pâtisserie by a Parisian pastry chef, Pierre Lacam, published in 1898. The recipe he gives is for biscuit (what they called the sponge cake) rolled with either chocolate or coffee buttercream. However, closest recipe that resemble modern version of Bûche de Noël recipes was by Joseph Fabre in 1905. It was published in the second edition of his book Dictionnaire universel de cuisine pratique. The cake used is a Génoise sponge cake (cake made eggs and sugar heated at low flame and then beat well to add rest of the ingredients), or other moist, rich yellow cake. Then it is baked in a flat jellyroll pan and frosted with ganache or buttercream. 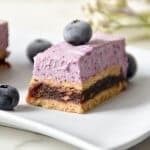 Then whole cake with filling inside is rolled into a cylinder, covered in chocolate frosting or butter cream, and textured either with a fork, serrated knife, or piping bag to resemble tree bark. Another way to make the cake is with multiple pieces of Génoise. The layers are spread with filling and placed one on top of the other and carved into the shape of a log. Smaller pieces of cake are stuck onto the main roll and covered in icing to represent trimmed branches. I didn’t use the recipe suggested by Tanusree, as it has leavening in it. When I read more about Yule cake I came to know that it doesn’t have any leavening. First I tried to make chocolate genoise using Alice Medrich recipe from cooking with Julia TV show. However my cake turned to thin crispy brittle. 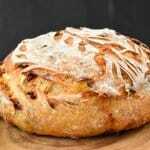 So discarded that and used this recipe from this French recipe site, where there is video also, however it French. Since food has only one language I was able to figure out what he is doing and also translated the recipe using Google translator. I made a vanilla sponge cake with all purpose flour and corn flour/cornstarch with 3 eggs, vanilla extract and sugar. You need to beat egg yolk and white separately. Then it is brushed with simple syrup and filled with chocolate whipped cream and finally frosted the cake with rich chocolate frosting. Trust me it worth all the effort, it is delicious cake. I used three recipes to make this excellent cake. If you want something fancier in your Christmas dinner table give it try. You are going to get compliments I can assure that. Delicious traditional yule cake made with vanilla sponge cake filled with chocolate whipped cream and frosted with rich chocolate frosting. Preheat oven to 350F and grease and line 9 x 13 inch jelly roll pan with parchment paper and again grease well on the top. In a kitchen aid bowl add 3 egg whites and half of sugar and beat well until it is very stiff and set aside. In another bowl, beat3egg yolks with 63g sugar until it become pale and creamy mixture. Then add the flour, cornstarch/corn flour, vanilla extract and melted butter. To this gradually fold in beaten egg whites in two additions with a spatula. Make sure not to break too much air bubble. While cake is cooling make simple syrup with equal amount of sugar and water and set aside. In medium microwavable bowl, microwave whipping cream uncovered on High 1 minute to 1 minute 30 seconds or until it just starts to boil. Stir in chocolate chips and corn syrup; let stand 3 minutes. Beat gently with wire whisk until smooth. Beat in vanilla. Refrigerate about 1 hour, stirring every 15 minutes, until spreading consistency. Unroll cake carefully, and remove towel. 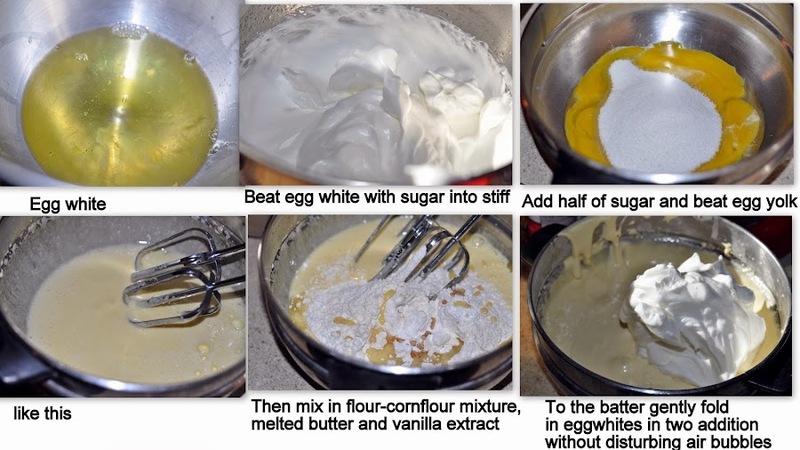 Brush the simple syrup over the cake. 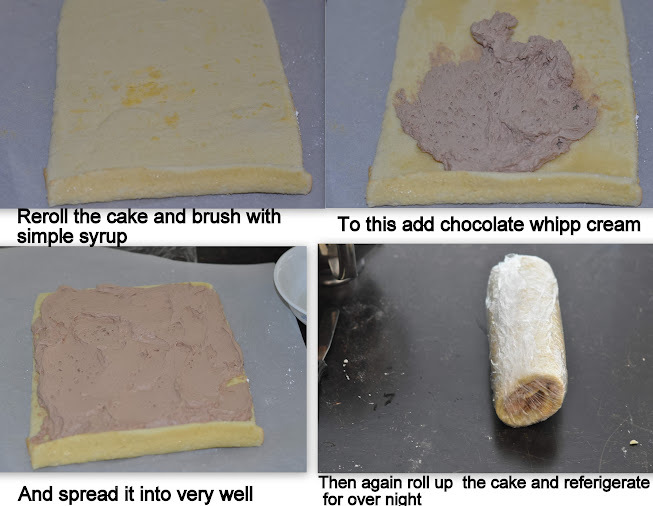 Then spread chocolate whipped frosting evenly over cake; roll up cake. Refrigerate the cake for at least 2-3 hours or overnight. Next morning place cooling rack on sheet of waxed paper. 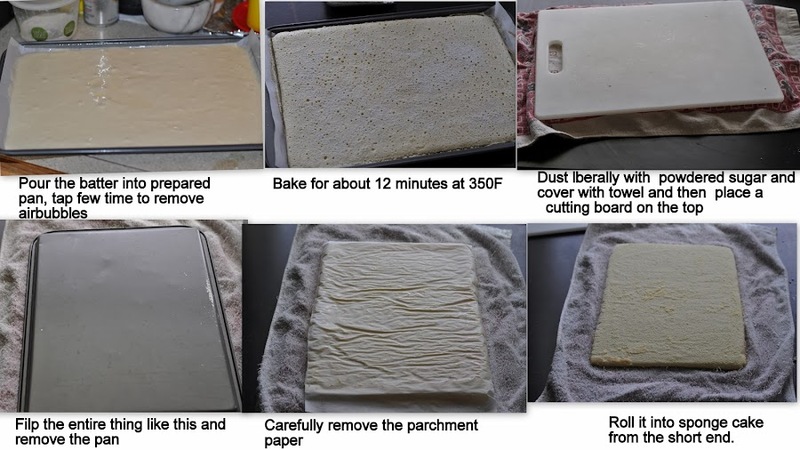 Take cake roll from refrigerator and place it on cooling rack; frost cake. Using fork, drag tines through frosting to look like log. Let stand 15 minutes. Transfer cake to serving platter. Store loosely covered in refrigerator. 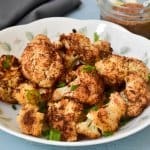 Let stand at room temperature 30 minutes before serving. Beautiful cake Swathi !! Look amazing and perfect !! Great effort. Perfectly done Yule Log. lets start the xmas party with your cake. Thanks Eliza, yes you can start with it. Dear Swathi, I also baked the sponge cake twice. Firstly, following the Sonomon recipe but I assure you that as you say, it is better not to use leavening in it. I decided to use my own recipe and it worked very well. Here in Spain we are used to bake this type of rolls and we call them “Brazo de gitano”. They don’t look as a log, but the method is the same: a sponge cake rolled and filled. The French tradition has also arrived here and at Christmas many people bake the Bûche de Noël and we call it “Tronco de Navidad” which means the same. Your explanation about the original tradition is perfect. I also have written something but after reading yours, I’ve learned more aspects of this ancient tradition. I’m sure that you’ll get lots of compliments with this Bûche. The result is fantastic. In the end of my post you can find two links. 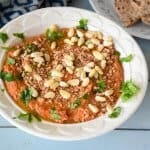 Two recipes but both of them have a salty filling. Thanks Marisa, you introduce me to another tradition in Spain. I am glad that you liked the cake. This yule is cake is found nowdays everywhere in Europe. Thanks Suja , I was finally able to post it today. Wow…that is one piece of art… i would rather sit starring and admiring its beauty rather than have a piece…beautifully done.. Beautifully done and very well explained!!! Wow.. Beautiful Delicious Cake… Chocolate frosting is tempting.. Perfectly made log.. Thanks for another wonderful challenge, Swathi! 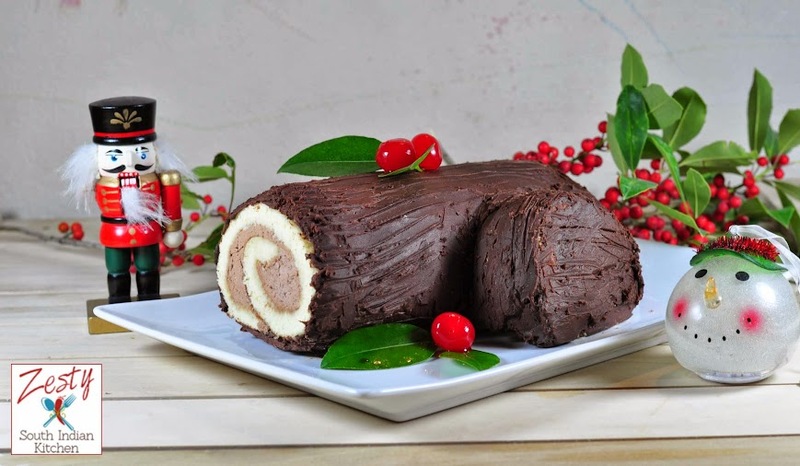 Your Bûche de Noël looks perfect! Love how soft the cake looks like, as well as the dark chocolate color!!! Wow! Swathi, this looks so perfect!! …frosting is so perfect…..bookmarked!! We are baking yule log cake for our bake-along too… Like to see Baking Partners’ bakes for my references… Yours looks so perfectly made. Wow ! great work,looks extremely nice. Lovely!!! I checked a few other Yule Log recipes on the net, and all of them require beating the egg whites and yolks separately. This is probably one of the reasons (along with the leavening) that made the Williams Sonoma cake more crumbly than soft. Will try another one next time! Ohf Swathi, the cake looks soooo yummy. Have always loved this cake and thanks for sharing the recipe with detailed pics. Wow ! You have made this cake so beautiful ! Looks really gorgeous , frankly I don’t want to cut it …. looks awesome and grt work..
wow the cake looks stunning swathi ji I am loving it. looks so real and I love the props u have used around so cute. A perfect little log cake. You are a wonderful baker my friend, I wish I could have a slice. I’ve been so under the weather, haven’t baked a cake in a while, craving for one. Beautifully done and explain well as usual, Swathi. The cake looks so perfect. Your log looks beautiful Swathi and it was nice to know how this log came into being. Glad you liked it. thanks for getting back with me. Thanks, Happy holidays to you and your family. Swathi, this is such a beautiful Yule Log! It sounds delicious too. 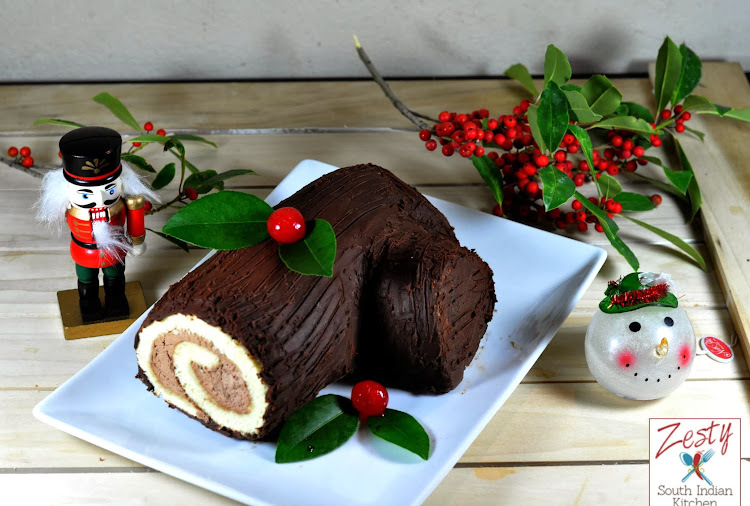 We eat a lot of Yule Log in England at Christmas and it is very rare to see one as pretty as yours! Wishing you a very Merry Christmas! 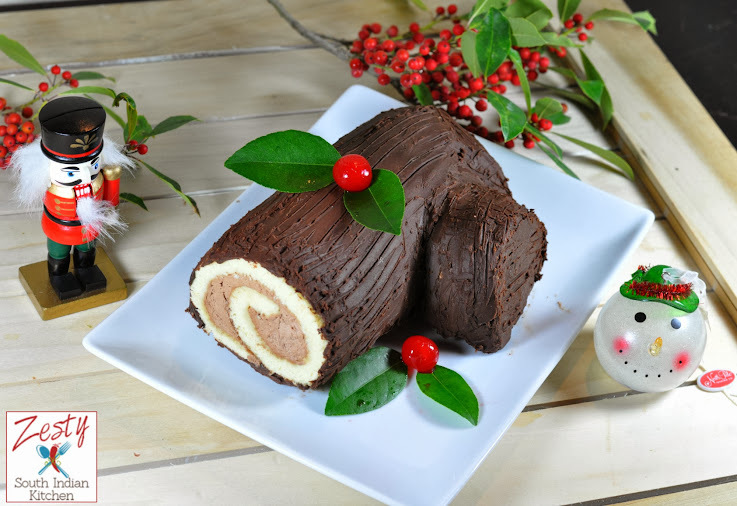 Your Yule Log is so beautiful Swathi! I didn’t know such a rich history was behind it. I still have it in my heart to bake one – so sorry I missed out on this month’s challenge. I will follow your recipe when I do – thanks for doing all the research.